Oh look, it’s yet another Muslim spreading Islam’s message of peace and tolerance. An al-Qaida sympathizer who plotted to bomb NYPD patrol cars and postal facilities and envisioned targeting U.S. soldiers returning home from overseas has been arrested, officials said. Mayor Bloomberg, Police Commissioner Ray Kelly and Manhattan District Attorney Cyrus Vance Jr. announced the arrest of Jose Pimentel, 27, Sunday evening at City Hall. Bloomberg said Pimentel, of Washington Heights, was “inspired by al-Qaida propaganda” but not part of any larger group and was not believed to be working with others. He was also “motivated by his own resentment of the presence of American troops in Iraq and Afghanistan,” Bloomberg said. Pimentel, also known as Muhammad Yusuf, was denied bail and remained in custody. It’s amazing how the authorities keep foiling these jihadi plots and that there hasn’t been a successful mass casualty terrorist attack on American soil since 9/11. It’s not like there aren’t plenty of disgruntled Muslims willing to give it a try. /are we good or just lucky? With Mubarak no longer in power to keep the social lid on, Egypt’s Muslim majority is doing what it does best, practicing their religion of peace and tolerance by attacking and killing Christians and burning down their churches. Egypt’s Coptic church blasted authorities Monday for allowing repeated attacks on Christians with impunity as the death toll from a night of rioting rose to 26, most of them Christians staging a peaceful protest in Cairo over an attack on a church. The spiritual leader of the Coptic Christian minority, Pope Shenouda III, declared three days of mourning, praying and fasting for the victims, starting today. He also presided over funerals for some of the Christians who were killed. Sunday’s sectarian violence was the worst in Egypt since the uprising that ousted President Hosni Mubarak in February. The clashes Sunday night raged over a large section of downtown Cairo and drew in Christians, Muslims and security forces. The violence began when about 1,000 Christian protesters tried to stage a peaceful sit-in outside the government-run television building along the Nile in downtown Cairo. The protesters said they were attacked with sticks, and the violence then spiraled out of control after a speeding military vehicle jumped onto a sidewalk and hit some of the Christians. There was no breakdown available of how many Christians and Muslims were among the victims, but the 26 are believed to be mostly Christian. Officials said at least three soldiers were among the dead. Nearly 500 people were injured. Egypt’s official news agency said dozens have been arrested. Remember, Obama and Hillary Clinton publicly called for Mubarak’s ouster and hailed the Egyptian “revolution” as an exercise in free democracy. Well, how’s that working out? Bibi pours on the reality and lays the wood on the Jew haters. Predictably, the Jew haters hated it. 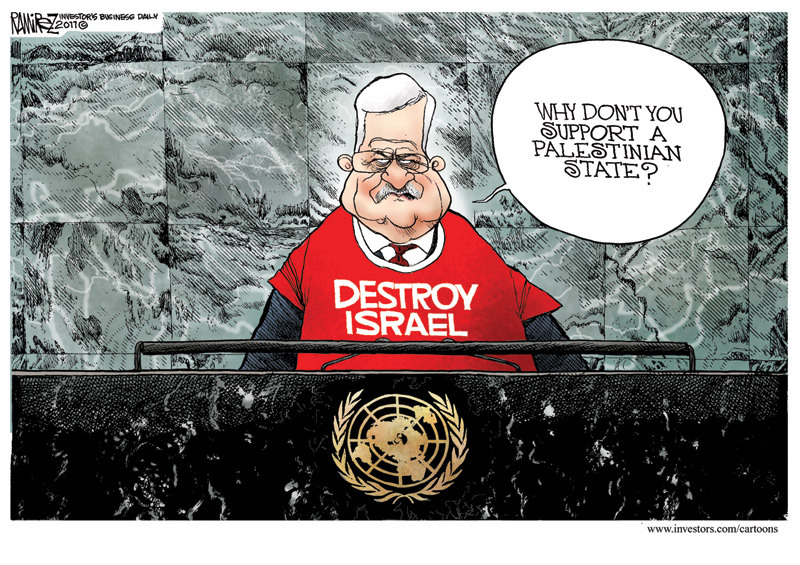 An hour after Palestinian President Mahmoud Abbas addressed the U.N. General Assembly to a rousing ovation, Israeli Prime Minister Benjamin Netanyahu received a more measured response. The ground truth is that there is no such thing as a “Palestinian”, there never has been in all of history, Gaza is controlled by Hamas, sworn to the destruction of Israel, and none of the “Palestinian” leadership will even recognize that Israel has a right to exist as a Jewish state. Their motto is “from the river to the sea“, they’re constantly attacking Israel, and they indoctrinate their children from birth to hate and kill Jews. /until they completely turn around their culture to conform with the civilized world, if that’s even possible, and accept peaceful coexistence with the Jewish state of Israel, why on Earth should these sick, genocidal, Islamic Jew hating “Palestinian” freaks be granted statehood? Be careful what you wish for, because it probably won’t turn out the way you’d hoped it would. The Libyan Transitional National Council (TNC) has issued a draft of a new constitution which has Islamic law as its foundation. According to the document issued by the TNC, Islam will be the state religion and the principal source of legislation will be the sharia (Islamic law). What Will Libya Look Like? Libya Made Safe for Sharia? Did NATO help pave the way for Sharia law in Libya? New Constitution for Libya to Enforce Sharia Law? Iraq, Afghanistan, and now Libya, three countries the United States has made safe for the constitutional dominance of Islamic law through force of arms. These are also three countries where Christians are routinely persecuted and killed just for being Christians living under Muslim rule. And then there’s Egypt, where the U.S. encouraged the overthrow of Hosni Mubarak and downplayed the possibility of the Muslim Brotherhood gaining power. Well, now Egyptian elections are coming up soon and it looks like the Muslim Brotherhood will, indeed, dominate the next government of Egypt. While Mubarak was in power, Egypt was Israel’s strongest partner in Middle East peace. Now, after Mubarak, the majority of Egyptians are calling for an abrogation of the peace treaty with Israel, weapons are being freely smuggled to Hamas through Egypt, and terrorist attacks are being launched against Israel from Egyptian soil. /is this the type of “democracy” and “freedom” the United States is looking to spread throughout the Middle East region? In Your Face Commie Heathens! Yes, it’s provocative, but please notice it doesn’t involve grisly carnage or any form of violence. Unlike Islam, it’s the Christian way. SOUTH Korea says a giant Christmas tree near the North Korean border will stay lit up till January 8 – a move likely to anger Pyongyang since the date marks the birthday of its heir apparent. The communist North sees the tree topped with a glowing cross as a provocative propaganda symbol. Cross-border tensions are high after the North’s deadly artillery attack last month on a South Korean border island and military drills by the South in response. The tree – a 29-metre metal tower strung with light bulbs – was lit up on Tuesday for the first time in seven years as marines stood guard against any cross-border attack on it. The tree, atop a military-controlled hill near the tense land border, was due to be switched off on December 26. ”However, we have decided to keep it until early January 8, in consideration of requests from religious groups,” defence ministry spokesman Kim Min-Seok told a briefing. Nothing, I mean nothing, drives heathens crazy like a giant Christmas tree topped with a giant cross. I’ll bet the North Koreans are just itching to shell it. The Taliban bite Karzai’s hand as he tries to feed them peace. The scene was set for something dramatic as President Karzai approached the lectern yesterday. His capital city was in lockdown. More than 1,600 dignitaries — tribal elders, ministers, MPs and ambassadors — had gathered in Afghanistan’s most venerated tent for a conference about peace. An estimated 12,000 soldiers, policemen and intelligence agents were involved in keeping all of them safe. The rest of the country was enjoying a two-day holiday. Moments into Mr Karzai’s opening address, however, he was interrupted by the whistle and thud of an incoming rocket. The Taleban — conspicuous by their absence — had, nonetheless, managed to get their point across. Plumes of smoke rose from beyond the tent’s perimeter as two more explosions followed. Then the sound of gunfire filled the air. Mr Karzai had described the Taleban as brothers. They, in turn, were trying to kill him. The President left the conference in an armoured convoy, as planned, while the rest of the delegates formed smaller groups to try to agree on a set of ground rules for negotiating with the Taleban. Um, I don’t think the Taliban is much interested in making peace, and why should they be? They can strike at will anywhere in Afghanistan and Obama’s already announced that we’re going to start withdrawing next year. /it doesn’t take Sun Tzu to figure out that all the Taliban have to do is wait until we leave and then go sack Kabul for the big win, can you say Vietnam strategy regurgitated? 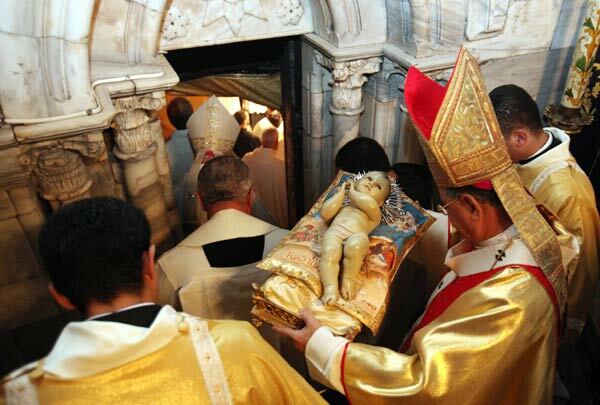 Latin Patriarch of Jerusalem Fouad Twal carries the statuette of baby Jesus during Midnight Mass ceremony which marks the beginning of Christmas Day at the Church of the Nativity in the West Bank town of Bethlehem on Dec 24, 2009. Thousands of pilgrims and dignitaries crowded into Bethlehem’s Church of the Nativity for a Christmas Mass, where Latin Patriarch Fuad al-Tuwal urged visitors to return home bearing a message of peace for the Holy Land. Entertaining crowds outside, bagpipers played carols and whirling dervishes danced, unfurling giant white skirts embroidered with the word peace in various languages. Some 15,000 visitors packed into the stone flagged square opposite the small Door of Humility where pilgrims stoop to enter the multi-denominational church, built above the spot where Christians believe Jesus was born. While much of North America and Europe were gripped in winter’s icy embrace, visitors to Bethlehem were buying chilled fruit juice in Manger Square and stripping off sweaters in the mild weather. “It’s about 20 degrees (68 Fahrenheit) and it’s a little hard to get that Christmas feeling I’m used to having,” said Phillip Well, 22, from Germany. Some tourists were bemused by the scene. “I’m not used to seeing marching bands and scout troops do the Christmas festivities, but it’s entertaining,” said 40-year-old Vijey Raghavan, of San Francisco, California. Inside the church at midnight mass, monks kept the celebrations traditional with Christmas hymns and al-Tuwal delivered a special Christmas message in six different languages, including Arabic. Likening modern-day pilgrims to the shepherds who harkened the angel’s message of Jesus’ birth, al-Tuwal extended blessings of reconciliation and hope to families worldwide. “You can take back with you the desire for peace and work for peace — peace in the Holy Land where the prince of peace was born. And peace to all the world for men and women of goodwill,” he said. Tourism in Bethlehem has picked up in the past few years, after collapsing during the Palestinian intifada, or uprising, which erupted in 2000. Hotels expect a 60 to 70 percent rise in business this year.